Kotaku 'Shop Contest: Death Cuddling: The Winners! Suuuuuu-paaaaaahh-maaaaaaaaan. And we have a winner. Last week I tasked our readers with giving Norman Reedus something to cry over. 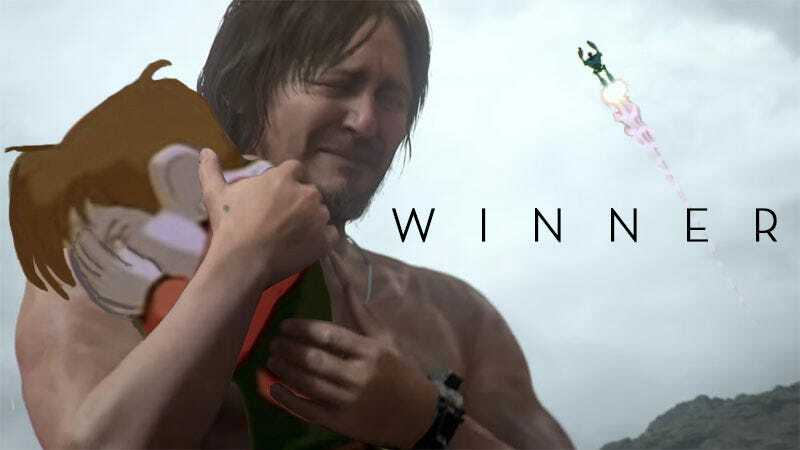 Using a still from the E3 trailer for Hideo Kojima’s Death Stranding, all they had to do was put something worth crying over into naked Norman Reedus’ loving embrace. First off, special thanks to Damien Fate for isolating Norman’s hands, making the hugging process that much easier. Normally I choose the overall winner based on a combination of comment stars given and personal preference. This week however, one entry buried deep in the comments completely killed me. Thanks a lot for bringing back those Iron Giant feels, Slinker. Once you’re finished bawling, scroll down to check out a hand-picked selection of this week’s finest also-winners, sorted by the order I pasted them into this post. Awww, don’t be sad _lm. It could have been worse. “Hush now,” Andersonium’s entry seems to say. KamilSeven gives Norman a tiny guitar to gently weep with. Aw, now Ren’s gonna make me cry. Tomorrow this will be me, Humanstein, though not sure if the tears will be happy or sad. DaeSkaarj pours one out for all the kitties. I vowed I would only pick one hugging Kojima pic. I chose GamerStyle’s. Atpunk created this way before the ‘Shop Contest, but everyone loved it so here it is. Whiskeyjack09 eventually got the director right. Santochilango ups the ante by one baby. Oldfactioned wins best animal entry. BubbsDaVinci did PSVR Norman best. Linkstwitch goes home with best Silent Hills hugging. Ilarm pisses Linus off something fierce. And the Oscar goes to... Damien Fate. At Risk Asterisk can go to hell for this one, that monster. Cartoonivore makes it a gameplay trailer. MrDeadScott knows how to hurt a guy. Marusame is lucky I didn’t use the first one. Cdsmasher offers a logical explanation. Marr0w gives Norman a GD Barbie. Sam Feinberg speaks for all the Crash fans. Ranier Islas dreams of future Destiny loot. Sdk007 reunites Normal with his greatest love. And finally we have MakoSucks with Norman Reedus smoking weedus. I had to end it on a high note, see? If your entry didn’t make it into the finalists, know that it was likely because I ran out of time. You’re all winners in my book. Join us later today for a brand-new ‘Shop Contest, unless I forget.